Introducing the dress show of the Quorn Evening Institute on Tuesday of last week, Mr H Cook, a master at St Bartholomew' School, Quorn, said he was making no apology for there not being an exhibition of the 17 in-line, the A-line, the sack-line, or any other line. The exhibition was being held, he explained, to show the work of the evening classes throughout the winter, and it was, therefore, being shown as the Quorn Evening Institute "Line". As such it was a great success. Two small girls who endeared themselves to the audience as they trotted round hand-in-hand were Susan Linford and Susan Sharpe. Both were wearing dresses made by their mothers. Susan Linford had a dress of blue and white cotton and Susan Sharpe a dress of blue and white bush baby material trimmed with white. Sisters from Woodhouse, the Misses Josephine and Maureen Leeson, both modelled garments they had made. Josephine wore a beautiful housecoat in turquoise and black bush baby material with collar, cuffs and buttons in rust velveteen, and also a buttoned through dress in mauve lightweight material with collar and buttons in purple velveteen. Maureen was wearing a gored skirt in black wool flecked with turquoise, red and white. Three items for the summer, and all exquisitely made, were shown by Mrs Besag of Loughborough. A dress admired by the entire audience was of white cotton striped with a floral design, and she also had a dress of black floral continental cotton and a black underpressed pleated cotton skirt with figured border. Matching outfits for mother and daughter were shown by Mrs Cook, of Quorn, and Sally. Mrs Cook was wearing a suit in bottle green gaberdine material with a slim skirt and boxy jacket, while Sally had a gored skirt of the same material. Mrs Fardell of Loughborough, modelled four outfits. One that particularly caught the eye was a dinner dress in black taffeta woven with royal blue lurex thread. Another model with four outfits to show for her weekly lessons in dressmaking was Mrs Smith of Woodhouse. Two of these items were suits, one of flamingo lightweight woollen material with a slim skirt and fitting jacket and one in a brown fleck with a slim skirt and boxy jacket. In addition to the dressing gown she had made for her son, Mrs E Taylor, of Quorn, herself modelled a cocktail dress in blue embossed taffeta with a rouched off-the-shoulder neckline. 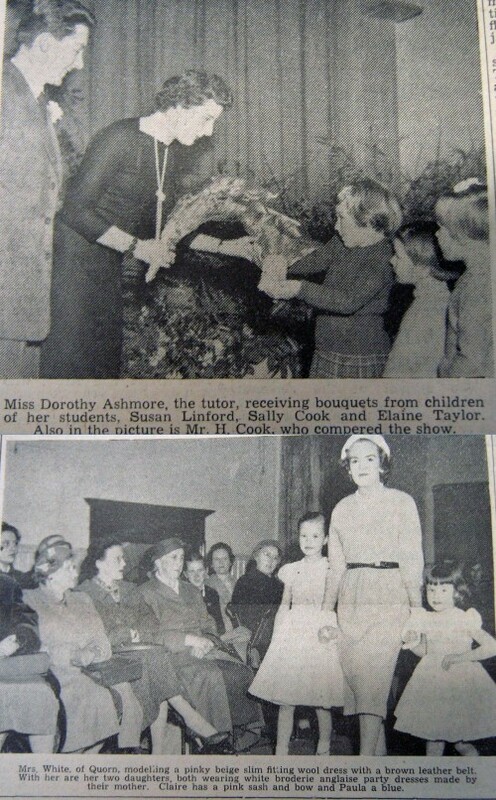 Others taking part in the show were: Mrs Linford, who modelled two dresses she had made; Mrs Halford, in a cotton dress and a wool pinafore dress; Mrs Oswin, in a woollen dress and a skirt and blouse; Mrs Larcombe, in a housecoat and cherry red grosgrain suit; Mrs Fletcher, in a pink rayon dress; Mrs M Taylor, in an off white duffel coat lined with a tartan; and Miss Elaine Taylor, in a knife-pleated tartan skirt made by her mother; Miss Tomlyn, in a lightweight woollen dress and a pinafore dress; Miss Darby, in a woollen suit, a skirt and blouse and an everglaze cotton dress; and Mrs Allen, in a woollen dress, a cotton dress and a blouse and skirt. The final model in an excellent parade was Mrs E Clayton, of Loughborough, who modelled a cream embossed brocade evening gown made by Miss Ashmore. Proof of the affection with which Miss Ashmore is regarded was shown when three small girls presented her with gifts at the end of the show. Mr Cook was also presented with a buttonhole. Speaking of her classes at Quorn, Miss Ashmore said that the season just ended was the happiest she had ever had. This is borne out by the students themselves, most of whom are carrying on for a further 19 weeks, to prepare for the summer days ahead. The stage had been beautifully decorated for the occasion by Miss Ashmore and two of her students, Mrs E Taylor and Mrs T White, and members of the Parent-Teachers' Association provided refreshment at the end of the show.